An artist's impression of what the new school could look like. Residents in Portlethen were left feeling frustrated this week after it was revealed that a new school planned to open next August is facing delays. The long-awaited new primary school is hoped to relieve pressure on the existing school network in the town, following the addition of 800 homes at Hillside. 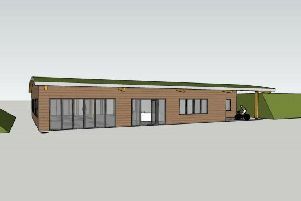 Several setbacks have meant that members of the community have spent several years campaigning for the community facility to be built. Just last month, pictures were released showing what the £13 million building would look like. However, after a private meeting of the Kincardine and Mearns area committee on Tuesday, it was agreed to delay the opening until October 2016. The news was relayed to Portlethen and District Community Council on Tuesday evening by Area Committee Chair Carl Nelson, who told members that a tender had been accepted and the contract will be awarded subject to land acquisition. The work will also include drainage, grassing and fencing for community pitches. However, he said, there are access issues with a third party. Nonetheless this is close to resolution. He added that Stewart Milne road works might take until September which could delay the building of the school. That was result in an October opening. North Kincardine Councillor Ian Mollison attended both meetings. He said: “As you would expect, community councillors were not pleased. Many blamed the council, though Carl warned that a judgement should not be made without being in possession of all the facts. Cllr Mollison said that the decision had been made in private for various reasons including financial affairs, terms of acquisition, tenderer for contract, and legal proceedings. The next meeting of Portlethen and District community council is on Tuesday, May 25 at 7pm in Portlethen Academy. Members of the public are encouraged to come along.